O'Neill becomes the unwilling receptacle for a library of alien knowledge, and ends up at an unlikely meeting with the Asgard. A probe sent to a distant planet has sent some interesting images back to Earth. Carved in the walls of P3R-272 are a set of characters that resemble one of the four languages inscribed on the wall at Heliopolis — a great meeting place of four ancient races, discovered by SG-1 more than a year ago (“The Torment of Tantalus”). 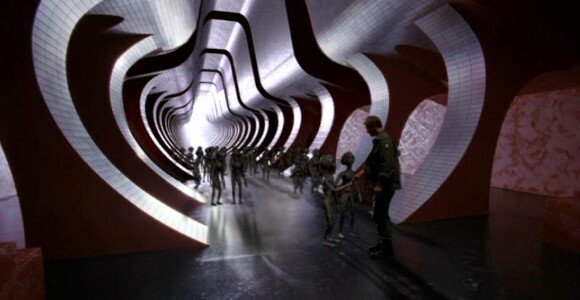 The meeting hall — where Daniel Jackson discovered invaluable “meaning-of-life” sorts of things — was destroyed, but SG-1 retained some records of the room. Daniel theorizes that one of the four languages is that of the Asgard, a powerful alien race who oppose the Goa’uld (“Thor’s Chariot”). It stands to reason, then, that the other three races are their allies and also oppose the Goa’uld. SG-1 gates to the planet where the symbols of one of the other three races has been found. They find strangely little: just a small room with bare walls and a circle of light in the center. With no apparent way out, they move to leave. But as Jack O’Neill steps through the circle of light, a viewing port of some sort opens up on the wall. Teal’c looks inside, and sees darkness filled with colorful lights. O’Neill looks next, and the device reaches out of the wall and grabs his head. He is held stationary for several moments, then released. O’Neill collapses to the floor in a catatonic state. SG-1 hurries back to Earth, where O’Neill regains consciousness a few hours later. Dr. Fraiser can find nothing wrong with him, but Jack is encouraged to take things easy for a few days. It isn’t long before he begins acting strange. During a briefing, O’Neill casually substitutes the word “cruvis” for the word “wrong.” Later, while sparring with Teal’c in the gym, he refers to legs as “kozars.” More and more, Jack is unwillingly speaking an ancient, alien language that he does not know. Daniel finds a linguistic connection to medieval Latin, and can eventually interpret most of what Jack is saying. The team soon finds O’Neill sitting at the computer terminal in the Stargate control room, entering new data at a tremendous speed and rewriting massive amounts of computer code. When he has finished, he has expanded the Stargate database to include many new gates throughout the universe, with addresses not even present on the Abydos Cartouche from which all other known gate addresses are calculated (“Children of the Gods”). O’Neill has not only become the repository of an alien language, but of an entire database of ancient alien knowledge. Fraiser determines that his brain is operating at over 90 percent capacity — nearly ten times normal. Frustrated, Jack eventually loses the ability to speak in anything but the alien language. He doesn’t entirely understand it himself, and he feels compelled to go “somewhere” through the Stargate. SG-1 begins to send probes and SG teams to the new planets entered by O’Neill, in hopes of finding some connection to the ancient alien race, to help O’Neill. The alien database inside his mind is threatening his life as it continues to progress. When one probe finds more of the alien text enscribed on a tablet on another planet, Teal’c and Carter (accompanied by two other S.G.C. officers) go through the gate to investigate. While they are gone, Jack is compelled to build something. He works on it for hours, and finally completes the small machine. He does not know what it is or what is does, nor does anyone else. Hammond soon learns that Teal’c, Carter, and their team is in trouble. The probe did not detect the presence of a second sun, which will soon raise the planetary temperature to nearly 200 degrees Fahrenheit. When the group tried to dial home, the D.H.D. malfunctioned and became stuck in mid-dial. Only Colonel O’Neill can find a solution to the problem. The knowledge in his head is that of “the Ancients,” Daniel surmises — the builders of the Stargate transit system. Because of this latent knowledge of the gates, O’Neill draws schematics of the dial-home device with instructions for fixing a mid-dial lockup. Carter and company return alive and well, but unsuccessful in finding a way to help Jack. But soon he has found his own solution. O’Neill hooks up his finished device — a power generator, apparently — to the Stargate power system. The computer begins to automatically dial a new address, and command personnel cannot regain access to the computer. But the seventh chevron locks, and amazingly, it is not the point of origin. The gate continues to dial to an eighth chevron, and engages a wormhole. Having never seen such a thing before, Carter theorizes that the extra chevron may be used to gate to a world that is farther away — even another galaxy. O’Neill goes through the gate alone, and ends up on an Asgard world. The advanced aliens recognize that he is speaking the language of the Ancients, and kindly remove the knowledge from his mind. O’Neill is thankful, and engages in a profound dialog with the aliens — “meaning of life” stuff. Jack returns to Earth, his mind restored — along with his faith in the future of humanity. Daniel Jackson determined that one of the four races who met at Heliopolis (“The Torment of Tantalus”) was the Asgard, Thor’s race (“Thor’s Chariot”). One of the inscriptions from the meeting place included a Norse symbol, and the Asgard have represented Norse mythology to races such as the Cimmerians. Indeed, Thor himself takes his name from the Norse god of thunder (or vice versa). SG-1 has twice encountered advanced alien technology that is sensitive to the presence of a Goa’uld: Thor’s hammer device, placed on Cimmeria by the Asgard to protect the planet from the Goa’uld (“Thor’s Hammer”), and the Ancients’ database on P3R-272. Obviously, these advanced races know of the Goa’uld and are greatly concerned about them. In contrast, some Goa’uld technology is keyed to operate only for a Goa’uld user, such as the ribbon/hand device and the healing device (“Thor’s Chariot”). O’Neill’s equation scribbled on the chalkboard was done in base-8 math, rather than our standard base-10 system. (Rather than counting to 9 and 10 in base-8 in order to reach a second digit, base-8 reaches the second digit at 8. The number 10 in base-8 is equal to 8 in base-10, and the number 20 in base-8 is equal to 16 in base-10.) Carter believes that the formula is a revolutionary method of calculating the distance between planetary bodies. It takes the S.G.C. computer days to calculate a new Stargate location based on planetary shift over thousands of years, using the addresses found on the Abydos cartouche as a reference point. This agrees with her initial plan in “Children of the Gods,” when the Abydos map room was discovered. Daniel stated that the Goa’uld had not yet discovered the new gates that Jack entered into the computer. This is conjecture, assuming that (1) Ra or another Goa’uld, and not the Ancients, created the Abydonian map room, and (2) the Goa’uld have discovered no new gates beyond those listed on Abydos in the past several millennia. This latter assumption, at least, seems unlikely. The S.G.C. and/or N.I.D. have been studying the dial-home device found with the second Earth Stargate in Antarctica (“Solitudes”). To place a gate on the planet with two suns, designated P9Q-281, the Ancients may have developed significant heat-resistant technology. Perhaps they chose that planet because the heat from the second sun would make it difficult for others to invade. Or, more likely, the planet’s orbit may have shifted since the Ancients left, reducing it to an inhabitable desert. The dialing program O’Neill put into the computer in order to reach the Asgard world required eight chevrons, rather than the typical seven. Carter presumed that the eighth may be necessary to calculate a distance factor, such as dialing an area code on a telephone. This seems to open the Stargate’s range 39-fold (since there are 39 symbols on the Stargate). Or, the eighth chevron may indicate travel to another galaxy (assuming the seven chevron system is limited to our own galaxy). It may be as simple as using the extra chevron to designate one particular galaxy, out of 39 traveled by the Ancients. Still, the last chevron encoded remained the symbol for Earth — the point of origin. The S.G.C. computer can now track the location of the other end of an established wormhole without having to send a probe through (as seen in “Stargate” the Movie). The Ancients moved on from our region of space millenia ago, according to the Asgard. This may refer to the Asgard’s galaxy, or the portion of the universe that includes both the Milky Way galaxy (Earth’s) and the Asgard’s. The latter seems more likely. Abydos, where the first Stargate mission took place, is outside the Milky Way, in the Kaliem Galaxy (“Stargate” the Movie). This is likely a point of discontinuity between the film and the series, however. According to the Asgard, there was once an alliance of four great races in the galaxy. Because the Asgard seem to reside in a galaxy other than our own, this was likely misspoken — there was once an alliance of four great races in the local universe. What has happened to this alliance is unknown — only that they abandoned their meeting place on Heliopolis (“The Torment of Tantalus”) and that one of the four races has moved on from this part of space. The alliance included the Asgard, the Nox (“The Nox”), the Furlings (whom SG-1 has yet to encounter) and the Ancients. The Ancients are the builders of the Stargate system. The Asgard consider humans to be well on their way to becoming the next great race in the galaxy, able to interact with the Asgard more on of the level of a peer. Humans have a long way to go, though, and much to prove — but we can assume that the Asgard will be watching our development with great interest. O’Neill traveled to the Asgard planet Othalla, in the Ida Galaxy. This may or may not be the Asgard’s homeworld, but the fact that the aliens did not specify that implies that it is not. Jack O’Neill – O’Neill suffered a major ordeal in having the Ancients’ knowledge downloaded into his human brain. He was profoundly frustrated, but it ended up paying off with a very positive experience with the Asgard. He may continue to interact with the Asgard on a personal level in the future. Whether or not the experience of having his mind overrun with advanced alien data will have lasting effects — physical, mental, emotional or otherwise — remains to be seen. O’Neill has also been greatly encouraged about the role of the human race in this huge galaxy, and this even larger universe. O’Neill removed the liquid naquadah from Teal’c’s staff weapon to construct his Stargate generator. Has it been used up, creating the need for Teal’c to find a new staff weapon? Or can it simply be replaced? Will the S.G.C. find any other valid eight-chevron addresses? Is there a ninth chevron on the Stargate, located with the eighth underneath the ramp? What function does it serve? The Asgard tell O’Neill that the Ancients’ repository of knowledge was not meant for him, because his physiology was not advanced enough to handle it. For whom was it meant? The Ancients’ allies? Or are the Ancients returning to our galaxy at some time? What happened to the alien alliance? The Asgard and Nox, and perhaps the Furlings, are still in this part of the universe. Are they still allied? Do they still meet with one another now that the Ancients are gone? Why did the Ancients leave this area of space? Where are they now? Did they colonize other galaxies and eventually migrate away, or did a conflict of some sort cause them to leave suddenly? Who are the Furlings? Are they still in our part of space? Are they even in Earth’s own galaxy? How large is the Asgard race? How much of space do they inhabit? How many planets? How many galaxies? VOTE! How would you rate SG-1's "The Fifth Race?"